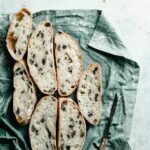 Homemade Olive Bread baked in a dutch oven and full of mediterranean flavors. Mix the warm water, sifted flour, salt, and yeast together with a wooden spoon in a large bowl. Cover with plastic wrap and let rest for 14-18 hrs. The dough should have doubled in size, be very sticky and full of air bubbles.Transfer dough to a floured surface. You should see a web like structure to the dough. Flour your hands and gently press dough into a rectangular shape. Place your chopped olives and herbs onto dough and began folding the dough inwards to work in the ingredients. Shape into a round loaf, seam side down. Transfer dough to a parchment paper lined baking sheer. Cover with a floured light kitchen towel and place in a draft free location to rest for another 1-2 hrs. Preheat oven to 450 F ( 232 C) and place your Dutch Oven on the middle to lowest shelf. Use oven mitts to remove preheated dutch oven. Gently lower dough into dutch oven still on the parchment paper and place lid on top. Bake the bread for about 35 minutes, then remove lid and let it bake the final 15-20 minutes uncovered. Finished loaf should have a nice golden brown crust. Once baked, lift the loaf from the dutch oven by the parchment paper and let cool on rack for 10-15 minutes before slicing.